Award-winning Russian violinist Nikita Borisevich is known for the precocious depth and sensitivity in his playing and utterly finessed technique. Nikita was born into a musical family and started playing the violin at the young age of five, with his father being his first teacher. He received his Bachelor’s and Master’s degrees from the legendary Moscow Conservatory, with Maya Glezarova and Marina Keselman, and completed graduate diplomas as well as a second Master of Music Degree at the Peabody Conservatory of Music in Baltimore with renown violinists and pedagogues Victor Danchenko and Herbert Greenberg. Since his debut with the Perm Opera Symphony Orchestra at the age of twelve, he has performed internationally in Germany, Czech Republic, Austria, Latvia, Russia, Spain and across the United States on renowned stages such as the Kennedy Center (Washington D.C.), the Great Hall of the Moscow Conservatory (Russia), Manuel de Falla Auditorium (Granada, Spain) and Shriver Hall (Baltimore). 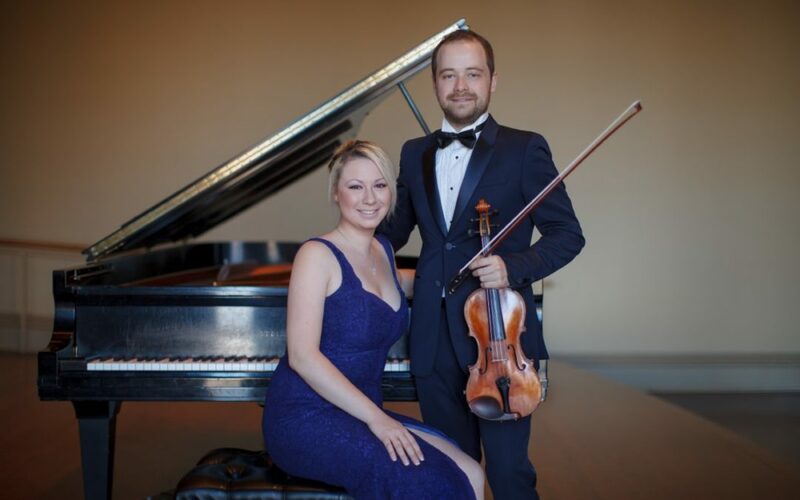 Today, Nikita and his wife, Margarita Loukachkina, piano, travel internationally thrilling audiences from the great stages of the world with their unique and extraordinary collaborations of violin and piano duo concerts. ​ In the 2017-2018 season, following an invitation by the multiple Grammy Award winner cellist Zuill Bailey, Nikita made his debut as a guest artist for the Sitka Summer Music Festival in Sitka, Alaska, Northwest Bach Festival in Spokane, Washington and Alaska Airlines Concert Series in Anchorage, Alaska. ​As an active chamber musician, Nikita won numerous chamber music competitions, among these are the Yellow Springs Chamber Music Competition (Ohio), the Coleman Chamber Ensemble Competition (Los Angeles, CA), and the Chesapeake International Chamber Music Competition (Maryland). Nikita has performed recitals throughout the US and abroad in various chamber groups. He has collaborated with Grammy Award Winner Zuill Bailey, Concertmaster of Dallas Symphony Orchestra Alexander Kerr, founding member of the Brentano String Quartet Michael Kannen, Maria Lambros (Peabody Conservatory), Monique Duphil (Oberlin and Hong Kong Conservatory), Navah Perlman and Martin Sher among others. In 2011, Nikita won the Grand Prix in the International Chamber Music Competition (trio division) in St. Petersburg, Russia and made his debut at the Moscow Philharmonic Society. As a member of a piano trio, he made his debut at the Kennedy Center, Therace Theatre in 2013, performed in the Washington College Concert Series (MD), the Friends of Chamber Music Concert Series (PA), and the Academy Arts Museum Concert Series (MD). ​ Known for her dazzling virtuosity and lush tone, award-winning pianist, Margarita Loukachkina, made her debut at the age of 15, performing Grieg Piano Concerto with the Williamsport Symphony. After studying at the prestigious Gnessin School of Music, Margarita was accepted with scholarship to the Peabody Conservatory at the age of 16 and since then has performed solo and chamber music recitals across US, Russia and Europe. Ms. Loukachkina is a frequent guest for international music festivals such as El Paso Pro Musica and Sitka Summer Music Festival, having her recording broadcasted on national television and radio stations. Margarita holds Bachelor and Master of Music degrees from the Peabody Conservatory, where she is currently a Doctoral Candidate. In addition to performing internationally and teaching master classes across the US, Margarita serves as Director of Applied Music at the Garrison Forest School, Director of Young Artist Program at the Baltimore International Piano festival and is on faculty at the Peabody Preparatory as well as The McDonogh School.